Inside Anker is a limited set of individuals who put quality first and put customers first. Employees. Individuals. Named people. Incubated is a way of saying not these same people. Any chance one of the evercams can be used like a baby monitor, and or, a baby monitor type add on with enhanced volume sensitivity? "Really hoping you are taking local storage seriously, and in a format like MP4 that's unencrypted, say if we need to easily export a video clip for law enforcement purposes. Also, Cloud Products always have a 'lifetime' after such a period, be it 5, 7, or 10 years, usually the cloud servers get cut off, as storage, bandwidth and colocation for servers is money. AWS or Cloud would be even more expensive. In this case, I want to be fully sure that I am able to utilize the camera watching live views as mentioned using the RTSP (not RSTP as stated in responses) which would allow us to utilize 3rd party programs to view a stream. Also, the email I received about storage would allow two software geo-fenced products on the same wifi network to talk to each-other. Please seriously consider giving us options to storage video externally on our devices, as some of us need to retain video for security reasons, and small cards would be limiting. I love Anker products, but I really do not like the lack of details on if RTSP will support live streaming, as I've seen conflicting responses. Some replies say that RTSP will be supported, which would allow us to live view a stream from the camera from a URL. Would the URL be from the camera itself? Really hope that in the very least, you add a mass-export for videos in an unencrypted form to the program. This would allow us to utilize the Enfy app to export to our 8TB / 16TB shares in an unencrypted form, so we would not need to lose videos when SD cards are filled. This seems like a good trade off, as you don't need to support NFS/FTP directly, we would still need to utilize the app, but Enfy would allow a mass export of a timeline or all video to an external drive. Thanks for answering, hoping we can come to some compromise where users like myself can view over RTSP in realtime when we wish, and export video if we would like, even if it's just a simple part of the Enfy application. For true security applications you need to be able to retain storage of video for longer periods than a SD-card can support." 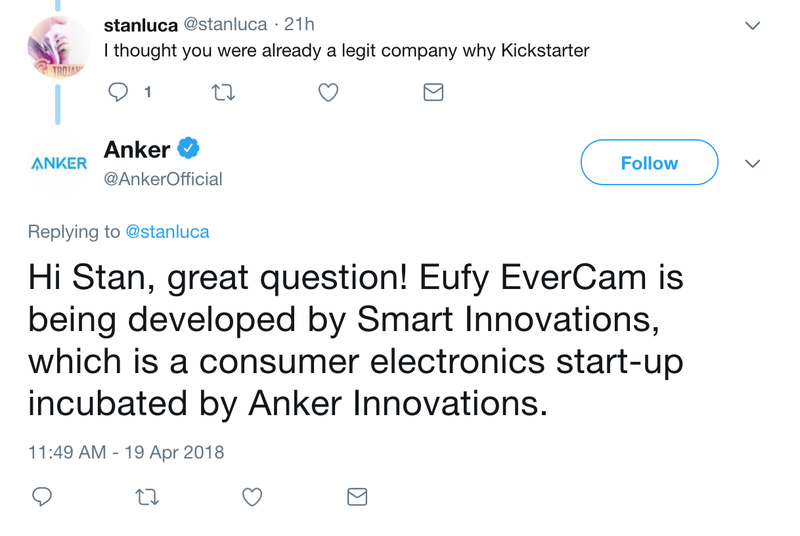 With the great success of the Kickstarter program, does @eufylife or @AnkerOfficial plan on making/releasing a Doorbell Camera? I want to invest in the product, but I also want all my cameras in the same ecosystem. Also, can we expect other I.O.T like Smoke / CO2 detectors? THIS! @AnkerOfficial I think now would be a perfect time to introduce an administrator from each key brand of Anker Innovations! Obviously they wouldn't be checking in nearly as much as you, but say to a similar extent of @AnkerSupport and @AnkerTechnical. What do you think?! If the community is growing bigger, we will consider increase the number of administrators in the future. How many active members in the last month?